The 3-pound burrito at Martinez Supermarket in Bridgeport. BRIDGEPORT — Passing the old-school yellow awning of Martinez Supermarket, most folks wouldn’t think to step inside to look for one of Bridgeport's best-kept secrets. But it’s here where you’ll find one of the neighborhood's biggest burritos. Through the front door of the family shop at 3301 S. Morgan, St, past the cash register, refrigerators and food aisles, you’ll find a meat counter at the back of the store. Next to that is kitchen and food menu designed with cartoon characters. One's called the "fat burrito." Order up between noon and 7 p.m. any day of the week and and 37-year-old Rudy Martinez will get to work building the supermarket kitchen’s specialty: A giant burrito. It'll cost you $8.99 plus tax. When it comes to meat, you've got plenty of options: steak, chorizo, pork, chicken or marinated steak. "Everything" means refried beans, cheese, cilantro, onions, lettuce and sour cream. 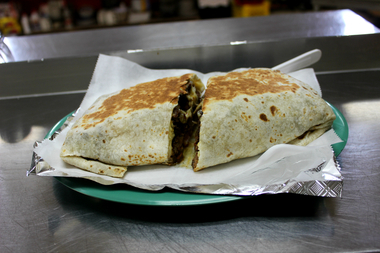 Reporter Ed Komenda reveals whether he finished the 'Fat Burrito' in one sitting. This baby hits the scale at a mighty three pounds. But you don't have to carry all that weight home. There’s a place to sit and eat. Be warned. As with the 17-inch burrito at Pancho Pistolas, most people can't finish the Fat Burrito in one sitting, through it's been done before. The kitchen has Styrofoam boxes for leftovers. On the way out, take a look at what might be the best selection of hot sauces in the neighborhood. The supermarket opened in 1977, but it wasn’t until a decade later — in 1987 — that Rudy’s father, Jesus Martinez, bought the store and shaped it into his family’s business. During the gang-infested '80s in Bridgeport and nearby Pilsen, you couldn’t walk into many taco joints unless you knew somebody. “It was a nasty neighborhood,” Rudy Martinez said. The family has kept quiet about its culinary talents because word-of-mouth has served them well over the past three decades. The other way people find the food is by happy accident. Shopping for spices or vegetables, they’ll naturally walk toward the sizzle in the kitchen. That’s all it takes, Martinez said, and they come back. Again and again. Visit Martinez during the week and you'll catch police officers, city workers and even Cook County Commissioner John Daley — he loves the tacos — ordering up lunch. Beyond the burrito station, Martinez Supermarket makes tamales and some of the best raw chorizo sausage on the South Side. For the past decade, Rudy Martinez has been making 350-pound batches of the spicy sausage — every week. During spring and summer, it goes out the door fast and lands on the grills of family parties all over the neighborhood. "My dad started with the chorizo," he said. "I make it now." 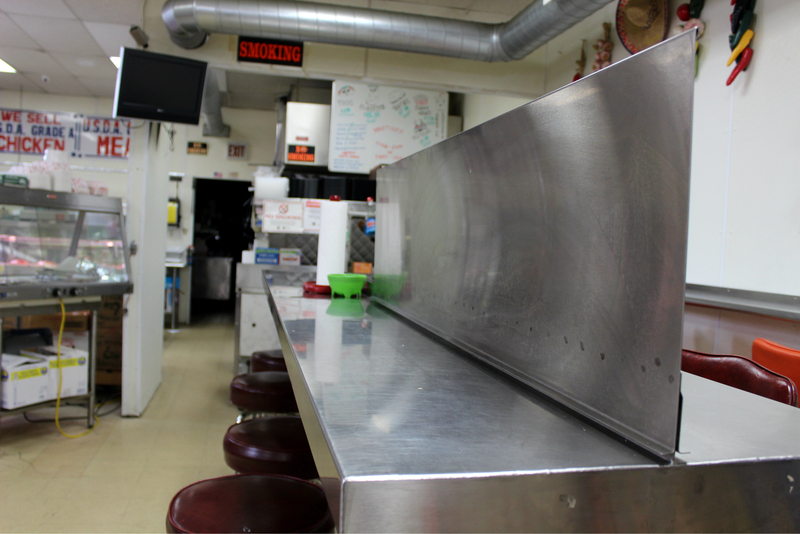 Rudy Martinez said he would like to expand the quick-stop, dine-in kitchen, but he needs to first find reliable help: A professional cook serious about the business of building big burritos for neighborhood folks.